WASHINGTON—Revealing that the physical world could no longer bear the weight of numerous contradictory realities, sources confirmed Friday that dozens of Whites Houses have begun to leak from a temporal vortex as President Trump’s rapidly changing story of meeting Putin tears apart space-time. 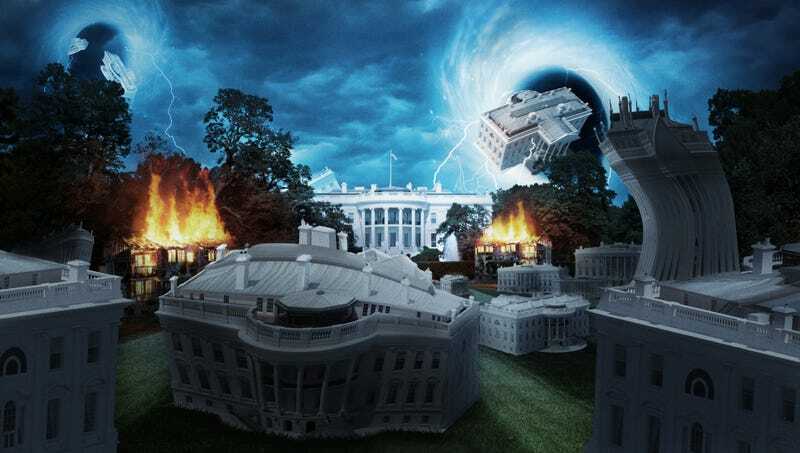 “A White House is blinking in and out of reality atop the Washington Monument, and another has materialized inside the wall of a Georgetown apartment building—it appears the fourth dimensional plane is collapsing in on itself as Trump’s untenable, competing statements rupture the very foundation of time and relativity,” said astrophysicist Maria Steagall, who confirmed an entire unit of the Army National Guard was instantly vaporized attempting to enter the vortex, and several members of the White House press corps were reportedly stretched out for the entire length of the Milky Way Galaxy and then collapsed to the size of a single atom after simply trying to make sense of the president’s conflicting remarks. “One witness reported seeing 6,000 Mike Pences pouring out of a small wormhole in the Cabinet room before suddenly vanishing. Countless universes are colliding and folding over each other every time Trump disputes his earlier statements; this is one of the greatest traumas the fabric of the universe has suffered since the Big Bang. In fact, the sheer heat being created by all these Putin stories battling each other to stabilize space-time may cause a black hole to form at the Earth’s core, causing the planet to implode.” At press time, scientists studying the vortex had confirmed that Trump was President in every single Earth reality and would be forever.